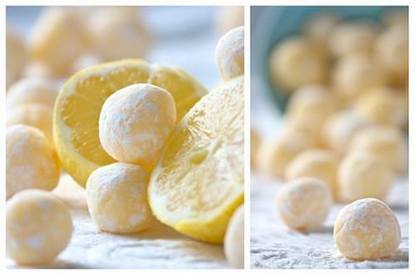 Honoring National Lemonade Day, these lemony truffles are a cinch to make and have such a wonderful velvety texture. Packaging them into pretty boxes turns them into the perfect hostess gift. NO BAKE recipe is perfect for summer and kids can help roll them into balls and coat in icing sugar! Melt chocolate, butter and cream over a double boiler or in a microwave. Stir until smooth. Stir in salt and extract. Allow to cool slightly before covering with plastic wrap. Refrigerate for 2 hours or until firm enough to handle. With a melon baller or small spoon scoop out mixture and form into 1 inch balls. Toss with icing sugar to coat. Store covered in the fridge for up to one week. Freeze for longer storage. * Using unsalted butter allows you to control the salty flavour of these truffles. The pinch of salt helps to cut through the sweetness of the white chocolate. If you decide to use salted butter make sure to omit the pinch of salt called for in the recipe or they will be far too salty. * If you want to amp up the yellow color, stir in some yellow food coloring along with the extract and salt.